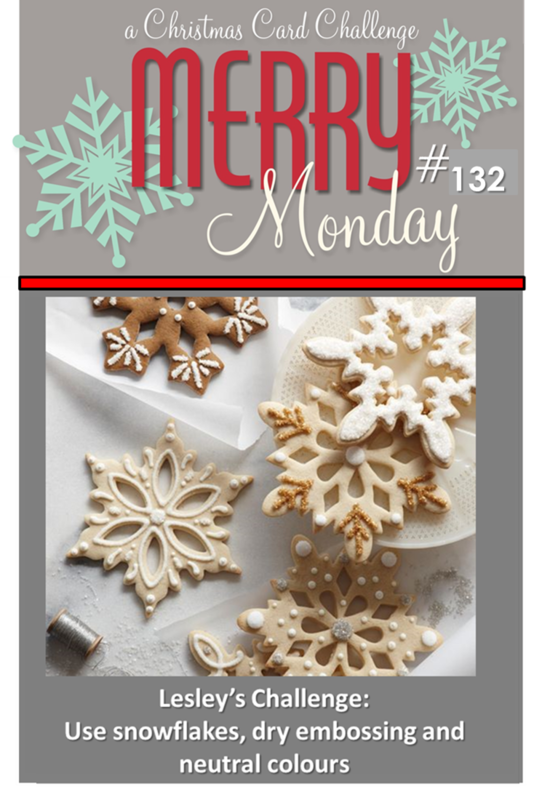 for the Merry Monday challenge to use Snowflakes, dry embossing and neutral colors. I began with an Ivory card base topped with lustrous, glossy Oyster Pearl CS embossed with Darice EF Snowflakes attached with foam tape. I love the elegant color of this CS. I added a torn strip of clear Vellum stamped with a sentiment from GKD that I heat embossed with white EP. The final additions were floating Snowflakes cut with Sizzix dies in DCWV Glittered paper also in a neutral color. I added pearls to the centers for more texture and shine. I am pleased with the final results. 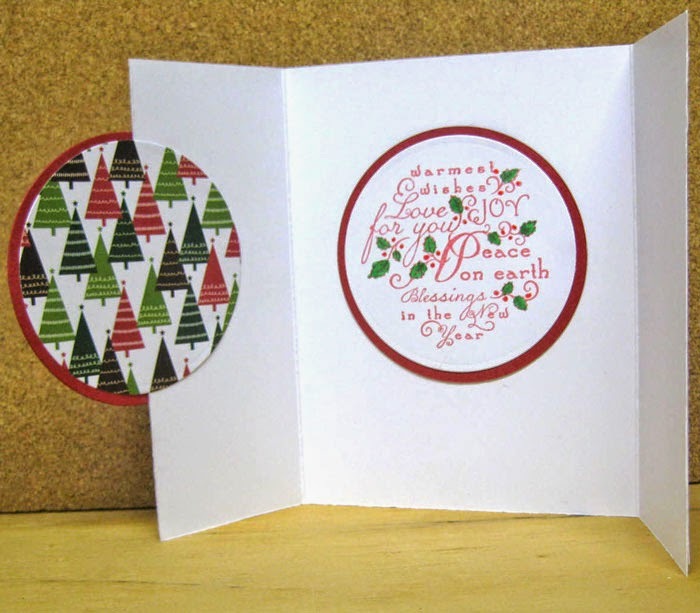 Merry Monday Christmas Challenge: Use snowflakes, dry embossing and neutral colors to create a Christmas card. Joy at the House That Stamps Built challenged us to use some scraps and leftovers from other projects for the Designer’s Choice Challenge. I had some vellum with some black and yellow CS's lying on my desk. 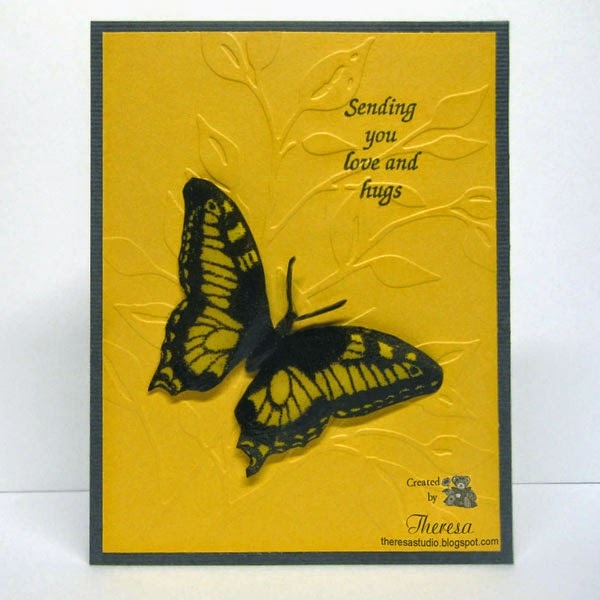 I decided to stamp the vellum with a Repeat Impressions Butterfly using versamark and heat embossed with Black EP. After fussy cutting the image I attached it with a foam dot to the yellow CS already cut to the right size. I embossed the mat with Cuttlebug EF Leafy Branch before adding the image and stamped the Repeat Impressions sentiment with Memento Tuxedo Black ink. 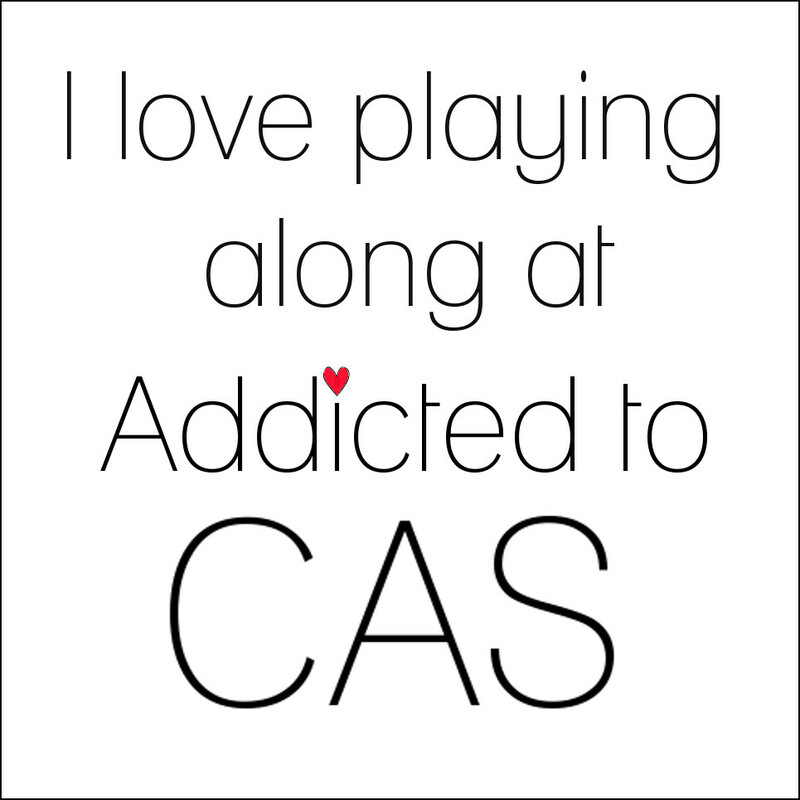 I simply added that to the Black CS that I had leftover on my desk. 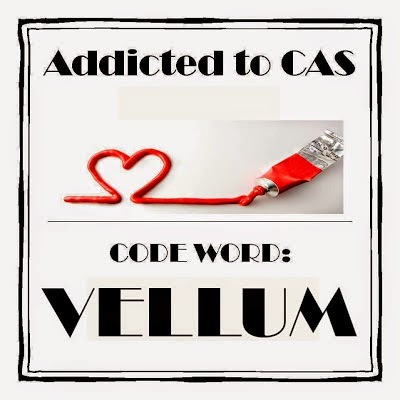 Addicted to CAS: Challenge #50 is to use vellum. Butterfly is made with vellum...has stained glass look in real life. I guess I could have used smaller scraps but I had the right sizes for the card at my fingertips. Hello! 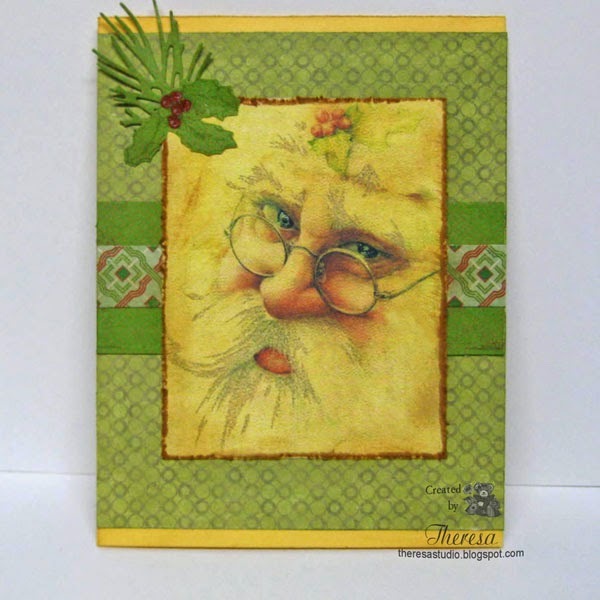 The focus of this card is a digital Image of Santa that I had saved in my files but do not know the source. After printing the image, I distressed the edges with a distress tool and ink. I assembled the card following the sketch from Sketch Saturday beginning with a card base of light gold CS, a layer of Green Pattern Paper and stripes of 2 other patterns, all patterns from Crate Paper Peppermint and Snowy Day pads. Added a sprig of holly (stamped with Flourishes Stamp and fussy cut) on top of a bit of pine bough ( Impression Obsession die cut) when I attached the image. I added some twinkle in Santa's eyes with Wink of Stella. Maybe you can see it if you enlarge the photo. I wish I knew the source of this Santa image. Does anyone know? I always try to include the name of the origin in my file but not this one. Hello! Thanks for stopping by. 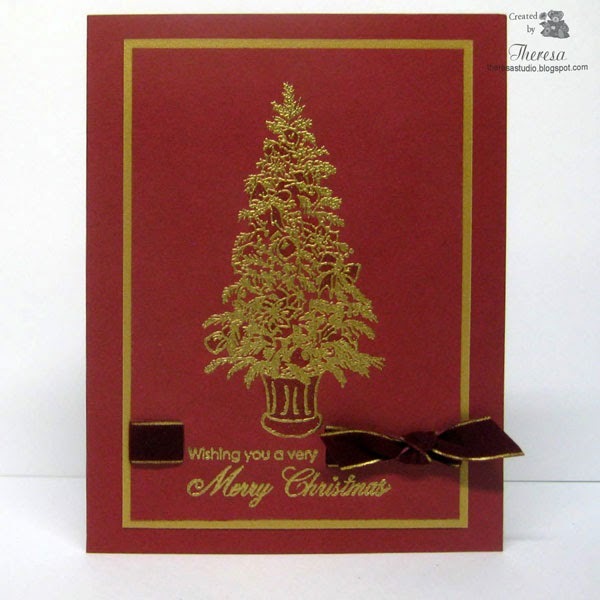 Today I am sharing a quick Christmas card using only 2 colors and heat embossing with Gold EP. I stamped the Tree and Sentiment from GKD Very Merry Christmas by Theresa Momber in Versamark on GKD Cranberry Tart and used a GKD Gold Metallic CS Mat and a Card Base of the Cranberry Tart. I wove in a ribbon of Red Velveteen with Gold Edging and tied on a simple bow to finish. 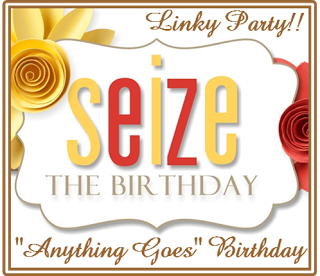 Seize the Birthday: Anything goes for a birthday. 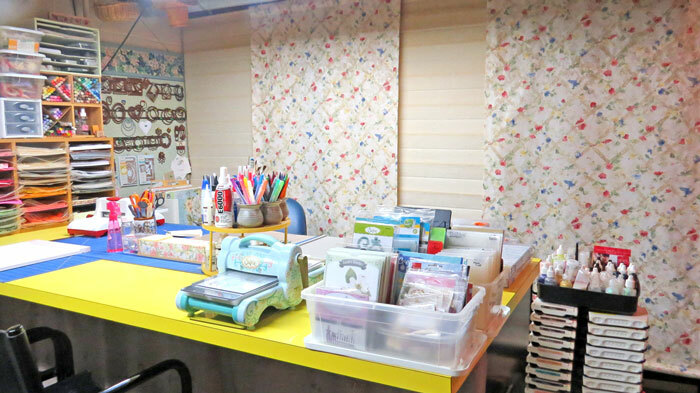 This week option is Washi Tape but I chose not to use. Hello! I am here today with a quick post....have to get some leaves raked and get ready for Trick or Treaters this afternoon. I used the sketch from Tuesday Morning Sketches to create this Christmas Card using a snowman stamp and sentiment from Heartfelt Creations. I stamped the snowman head with Memento Tuxedo Black ink on white CS and colored with Copics R59,BG72,75,B0000, N4,7 and an orange marker. Added some Clear star for shine on cheeks. 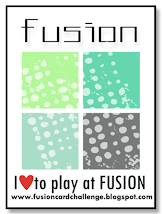 Fussy cut the image and placed on a Kraft oval embossed with Darice Snowflakes and sponged with teal. 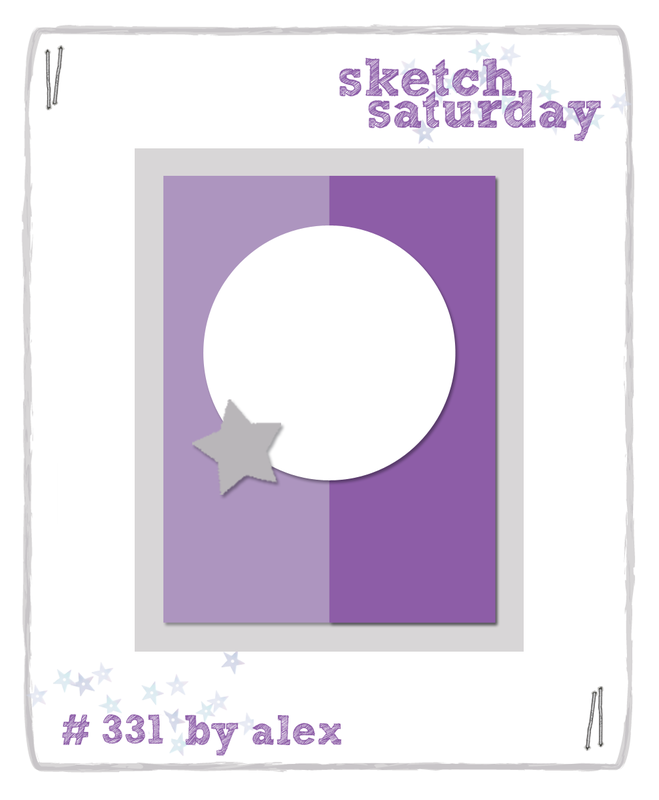 Following the sketch, I used pattern papers from Fancy Pants Timbergrove pad to assemble card. Used Cuttlebug EF Herringbone to emboss one of the patterns. I added the sentiment stamped on Kraft label die cut stamped in Memento Teal Zeal and a snowflake cut with a Sizzix die and covered with Stickles Frosted Lace. Craftyhazelnut's Christmas Challenge: Challenge-if you want to get ahead get a hat- Christmas creation must feature a head ... with or without a hat! 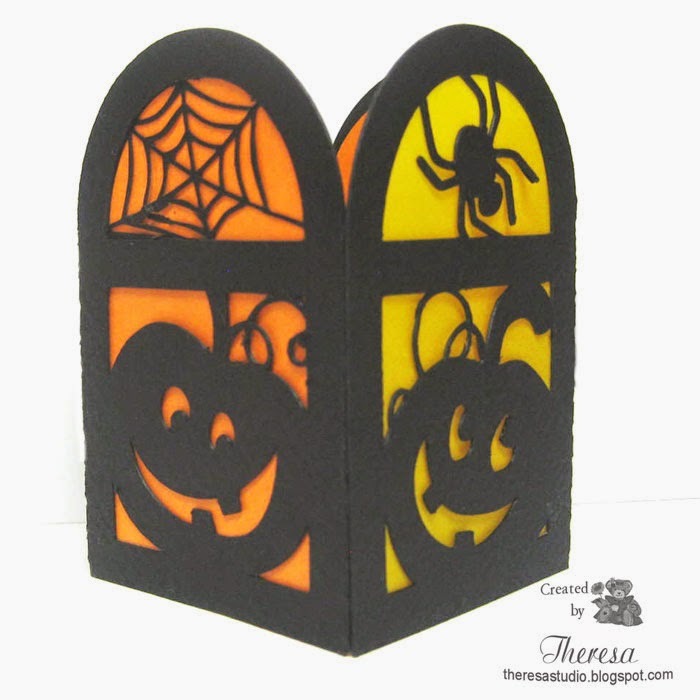 I'm back.... with another Vintage Halloween Card made with a Digital image from Magic Moonlight Studio. This was printed and matted on yellow CS that was embossed with Cuttlebug EF Forest Branches and inked with Red Ink. I placed this on a Card Base of Kraft CS and added strip of ribbon, border of black drippy goo ( Martha Stewart punch), and bats ( Plumrose Lane digis). I used Wink of Stella on the Cat's eyes and whiskers and the pumpkin eyes and mouth.....looks great in real life but not so much in the photo. Simon Wednesday Challenge: Simon says get crafty and use Kraft. The Kraft Journal: Challenge #194 is color challenge using colors from the graphic on right. 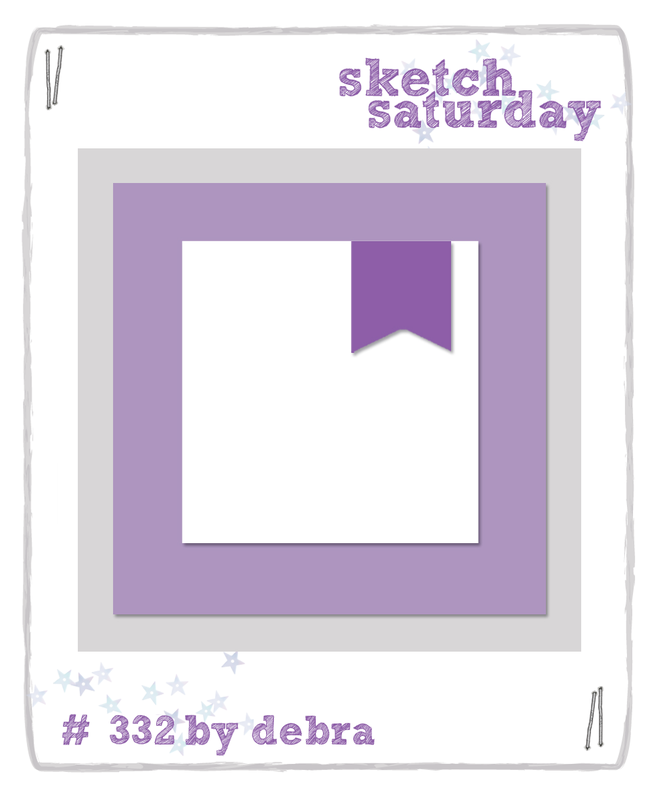 Digi Sketch Challenge: Use Pink and sparkly and/ or use the sketch. I used the sketch shown on right. No pink here. Hello! 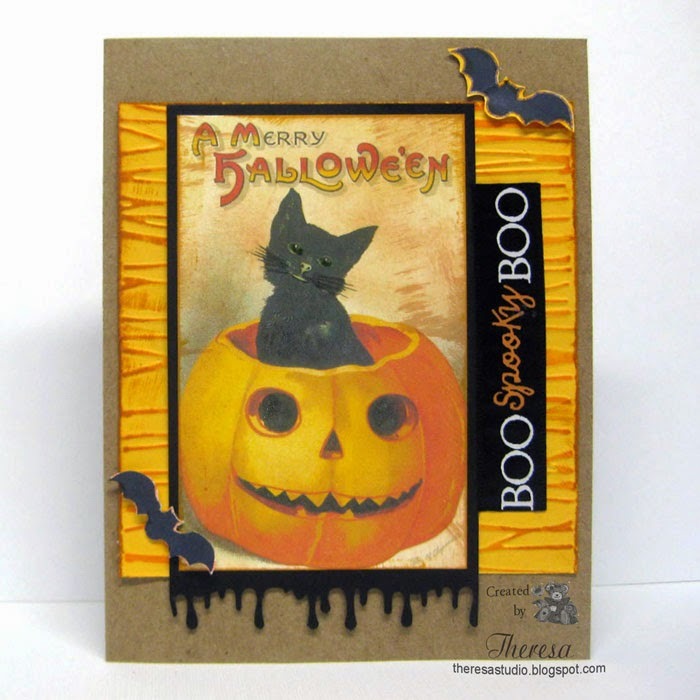 For this Vintage Halloween card, I have used a Vintage image of the cat on a pumpkin from Plumrose Lane that I sized and printed and then fussy cut. I arranged that with vintage looking pattern paper from Echo Park The Apothecary Emporium pad, 2 of which I cut with Cheery Lynn Swedish Spring Oval Frame doily die. The card base is Slate gray CS layered with another pattern from the same pad. I placed some Kraft CS under the doily with the image before adhering to the card. Added a black Olive branch cut with Cheery Lynn die, some red ribbon to the cat and glossy accents to the pumpkin. Colored the cat's hat red with a Copic. Attached a Kraft tag stamped with MFP's stamp with Memento Tuxedo Black. The Kraft Journal Challenge: Make it Monday Challenge # 194 Color Challenge shown in graphic on right. 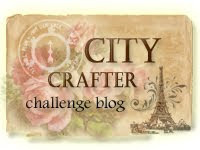 Cheery Lynn Designs Blog: Challenge #155 is Vintage. 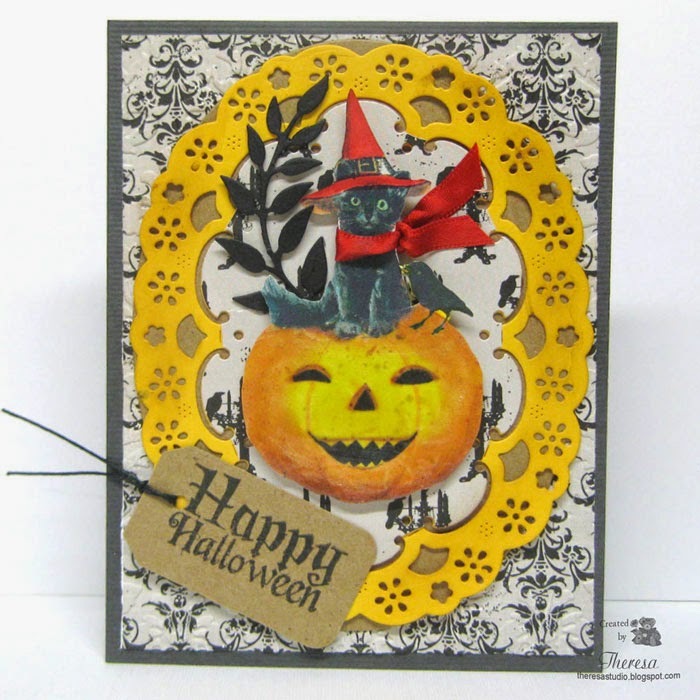 It looks like I am still doing last week challenge for Halloween but this card uses vintage like papers and a Vintage Halloween image. 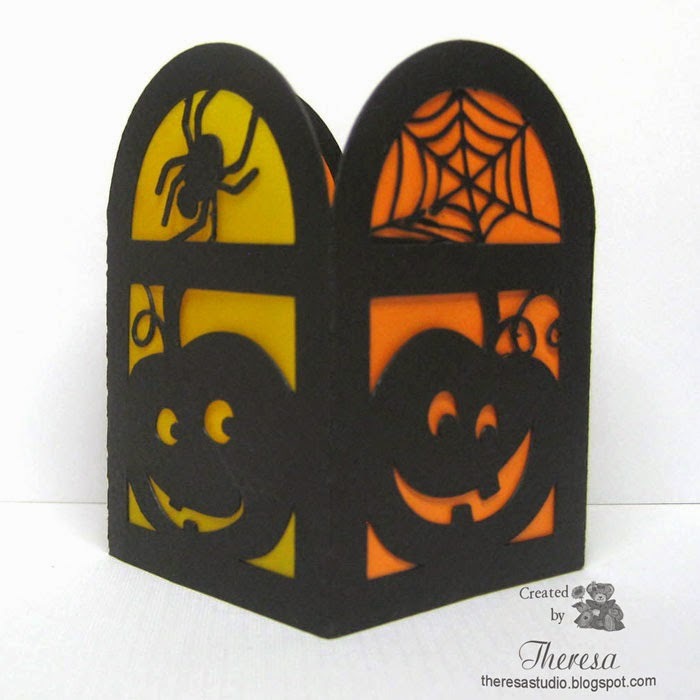 Just for fun, I made this Halloween Lantern using the Cameo to cut a Silhouette file from Black Cardstock, Orange CS and Yellow Vellum and assembled with Scor-tape. 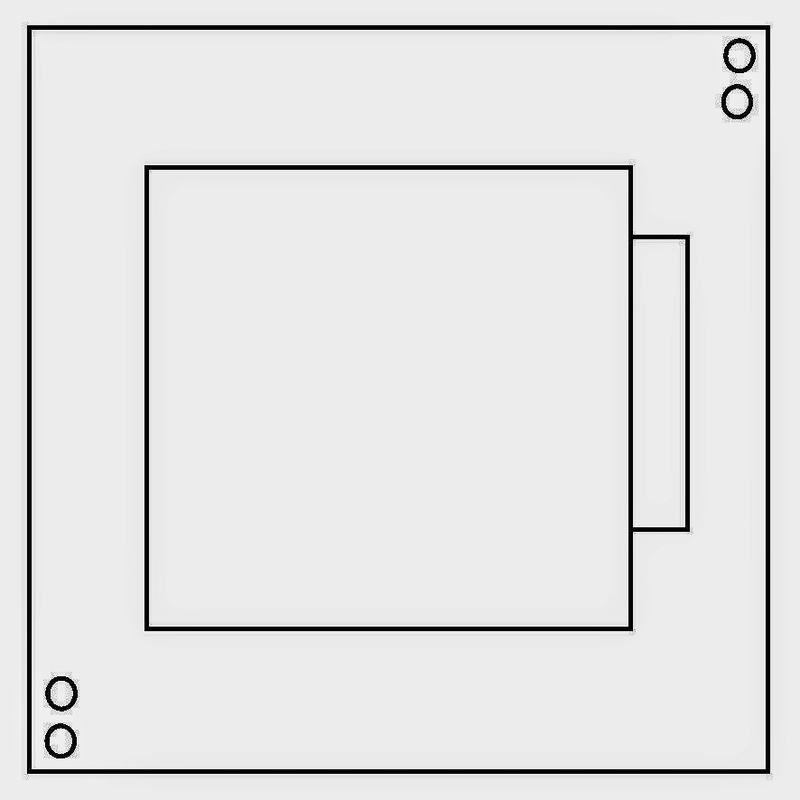 Each side has a different design. I used it with a battery operated flickering candle. Welcome! Today I am back with another Christmas Card which I created with Non-traditional Christmas Colors. 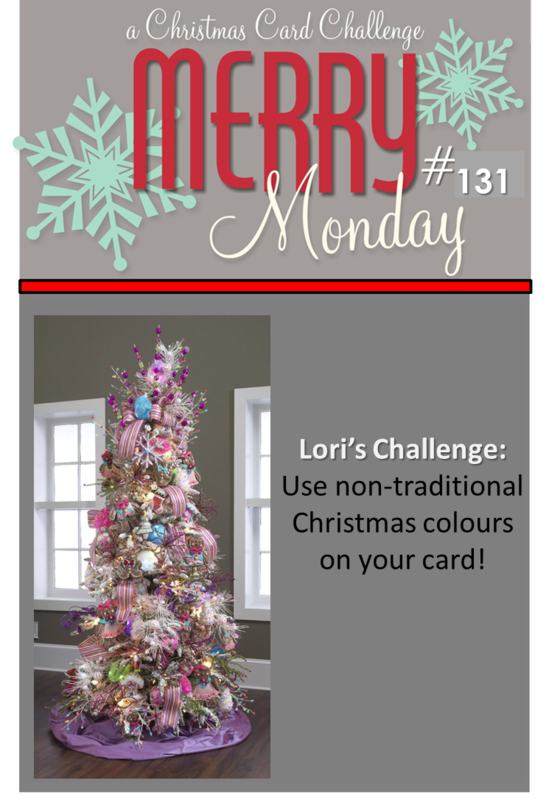 My inspiration was the Merry Monday Challenge to do just that --create with Non-Traditional colors. 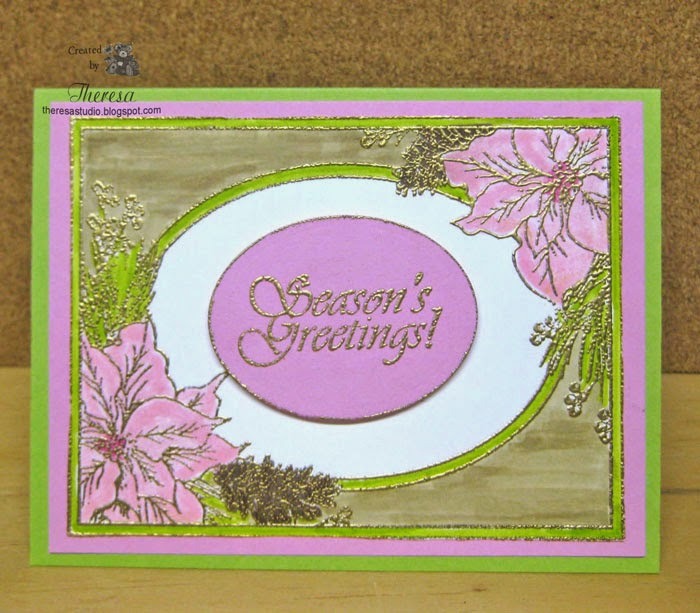 I began by heat embossing the Festive Frame from Melanie's GKD stamp set on White GKD CS with Gold EP and colored in the design with Memento Markers Pear Tart, Angel Pink, Rose Bud, and Rich Cocoa. I filled in with Copic Gold Marker. I trimmed the frame and attached to a mat of GKD Bubblegum Pink CS and then to a card base of GKD Jelly Bean Green. For the sentiment I heat embossed it on an oval of Bubblegum Pink with Gold EP and did the edge of the oval as well. I attached this to the center with foam dots. 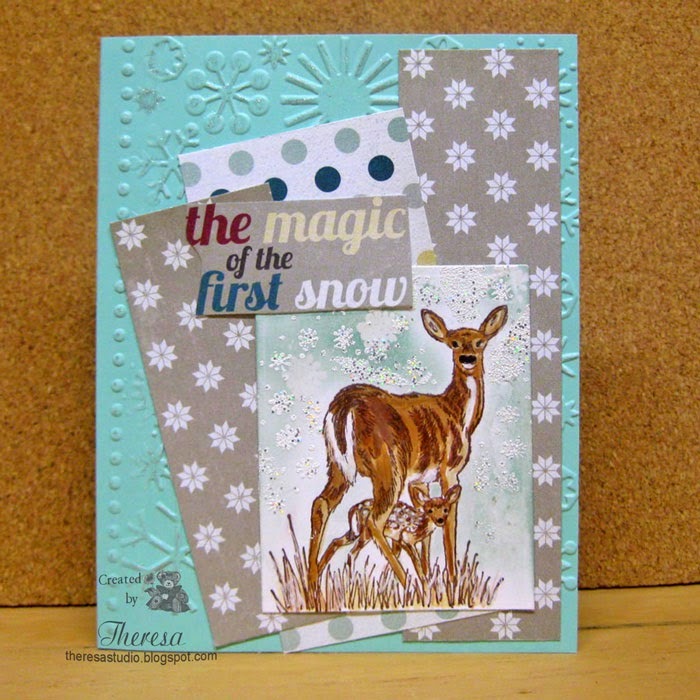 Mod Squad Challenge: Judy's Challenge is to create your most very favorite kind of card. I guess my favorite cards include heat embossing and coloring. I am always fascinated by watching the heat transpose the EP, especially gold powders. Craftyhazelnut's Christmas Challenge Extra: Anything goes for Christmas. Craftyhazelnut's Christmas Challenge: Use something new or never used. I did not think this would qualify for Hazel's challenge but I have never used these colors or papers for a Christmas Card so I guess I qualify. do not need any more. 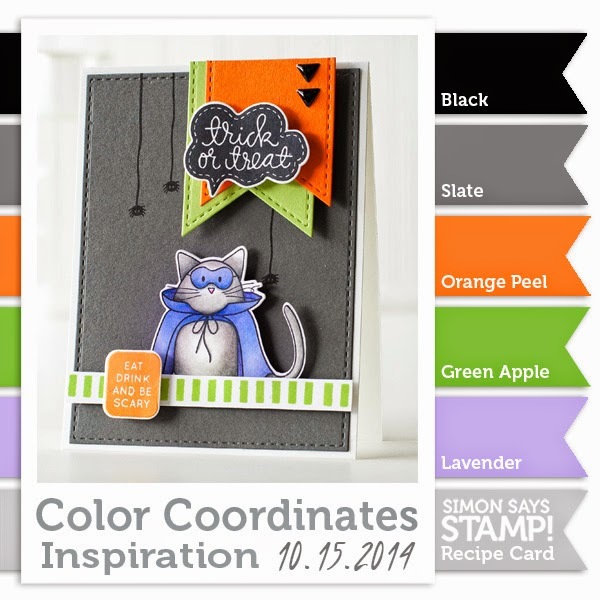 But Halloween cards are so much fun that I gave in and had to make this one for Simon Says challenge. 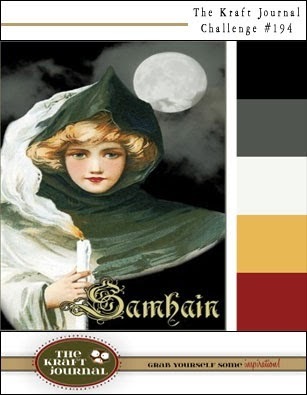 We are to use the colors in the graphic shown on the right. I used stamps from MFP's Boo To You and papers from my stash. 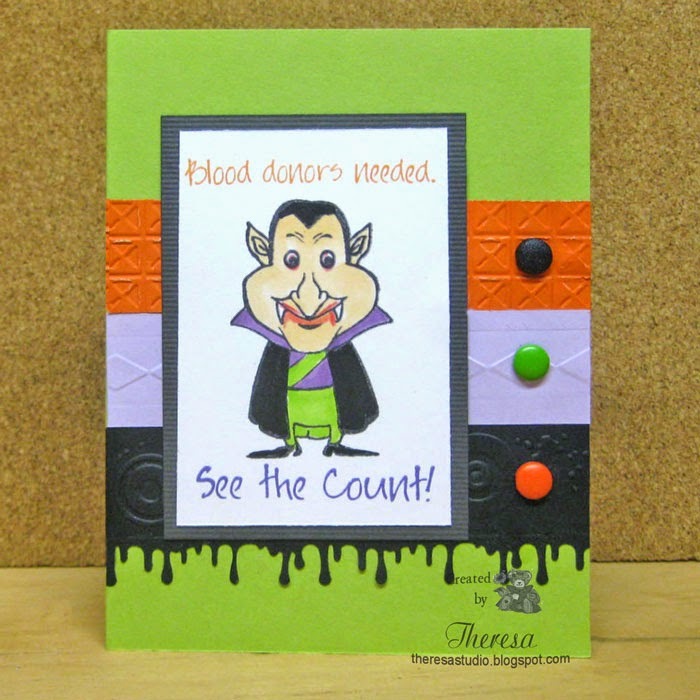 Dracula was stamped with Memento Tuxedo Black ink and colored with YG03, V15, E51, 100 and re pencil. Memento Grape Jelly and Tangelo inks were used for the sentiments. I embossed each strip with borders from Cuttlebug Pop Culture EF. The drip was punched with Martha Stewart border punch. Shopping Our Stash: Theme is Halloween. 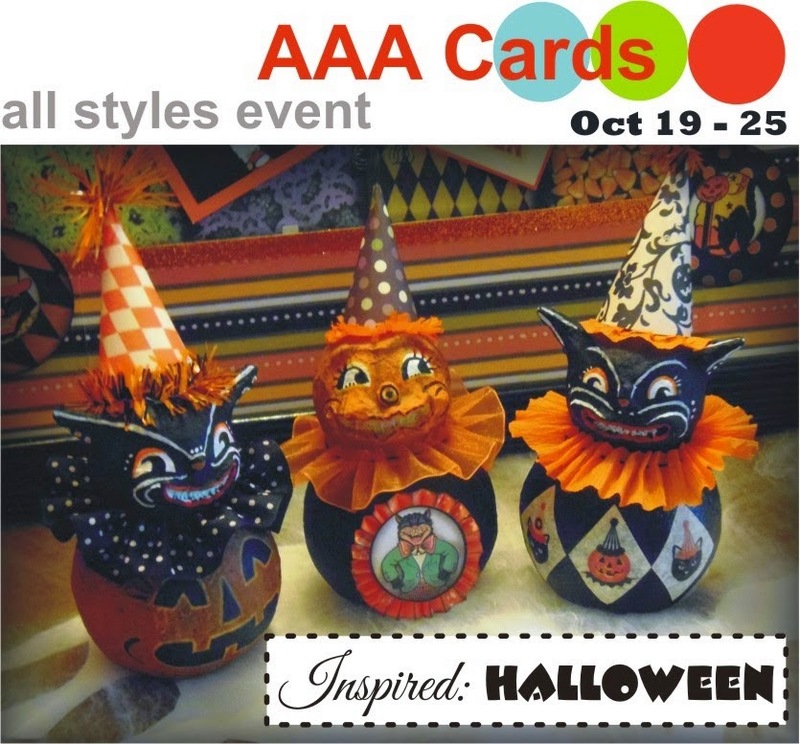 AAA Cards: Make any style card for Halloween. Hello! 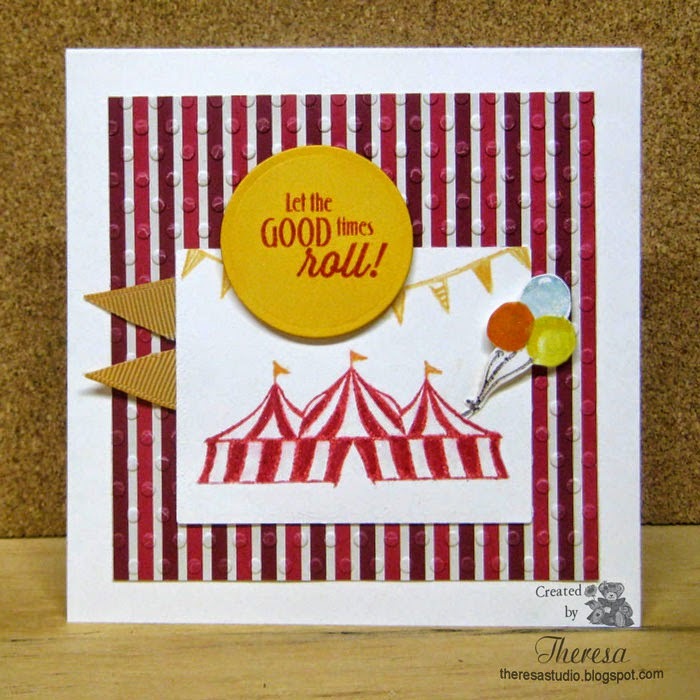 When I saw the current challenge Circus at Cupcake Inspirations (see graphic on right), I knew that I had to use the Flourishes stamp set Under the Big Top to create a card. I used the sketch from Sweet Sunday with Stripe Paper from American Crafts Kringle & Co paper pad with the Tent, Banner, Balloons, and Verse stamps. 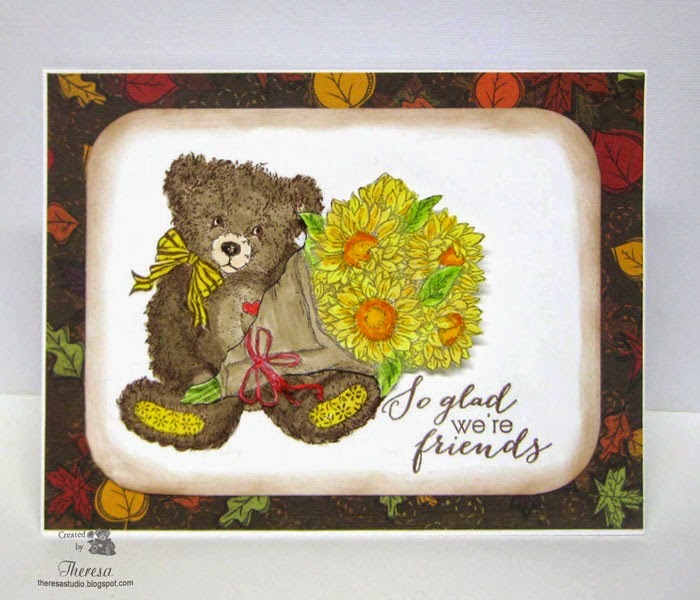 Other supplies: Ivory CS, Gold CS, SU Ruby Red Ink, Memento Cantaloupe, Memento Markers Summer Sky, Tangelo, Rich Cocoa, Circle and Rectangle Dies, Gold Grosgrain Ribbon, Cuttlebug EF Polka Dots. 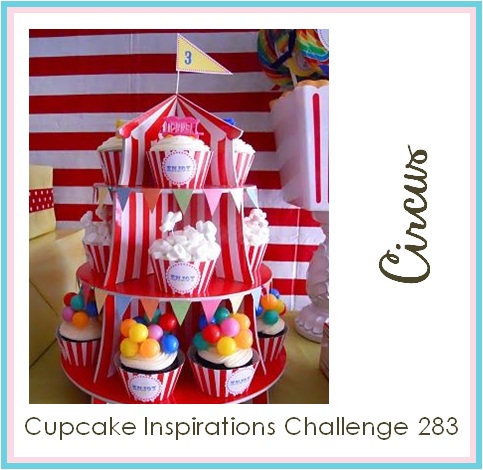 Cupcake Inspirations : Challenge #283 Circus. Welcome! 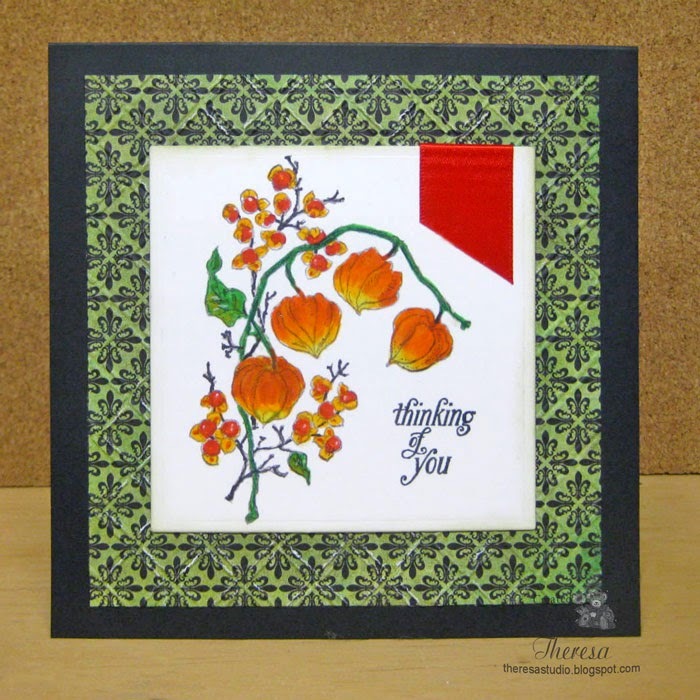 I was playing with the Chinese Lanterns stamp from Power Poppy Sunny Harvest set and created this card using the sketch from Saturday Sketch challenge. The image was stamped with Memento Espresso Truffle ink and colored with Copics R24, YR07,07,18, YG 09,67, Y13,17,E25 and cut with Nesties Square Die. I inked the edges very lightly with Memento Pistachio. The sentiment was stamped with Memento Tuxedo Black. 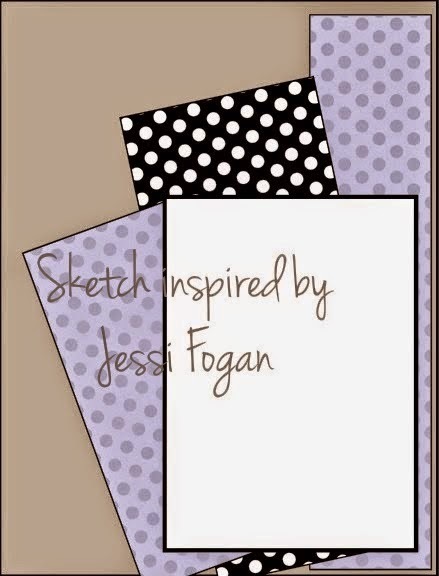 I used a pattern background from Teresa Collins World Traveler pad which I thought gave a dramatic look with the Black Card Base. The pattern was embossed with Cuttlebug EF Wicker Weave. The ribbon banner of Orange Satin was the finishing touch to emphasize the bright colors of the lovely Chinese Lanterns. Power Poppy Peep of the Week: Share a creation using Power Poppy stamps. Hello! This card is for the Mix It Up Monday Challenge - Over the Deep Blue Sea at Stamp TV. Tricia has asked us to make a Water Themed Card. We can use nautical images, rain, snow... ANYTHING that has water! Since I do not have many Nautical Theme Stamps from GKD (note to self....buy some GKD nautical stamps), I had to stretch my resources for this card. 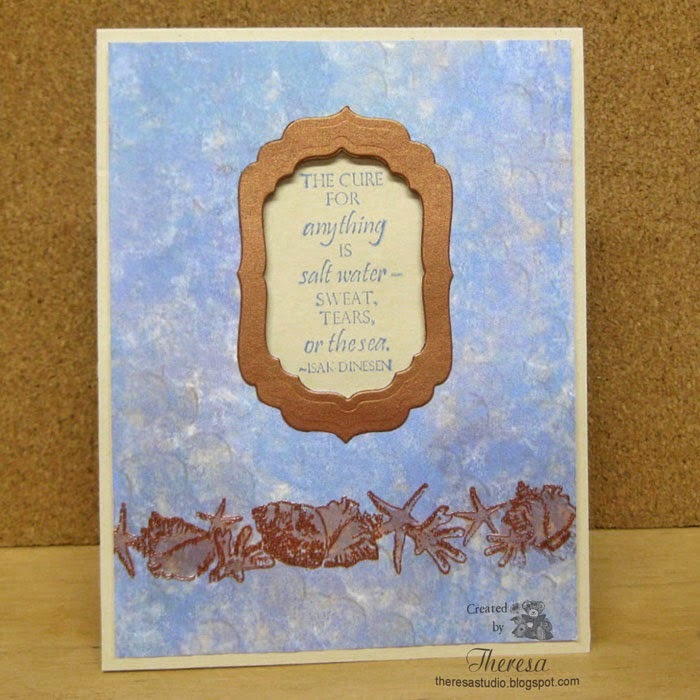 I selected a verse from Melanie's Gifts from the Sea set and seashells from her A Year of Borders and combined them with a water looking Pattern from GKD Poolside paper pad to create this water themed design. Other supplies used were: GKD Soft Sand CS, Metallic Copper CS, Versamark, Copper EP, SU Blue ink, and Nesties Label 4 Dies. The embossed verse was recessed under the copper frame. Hello! 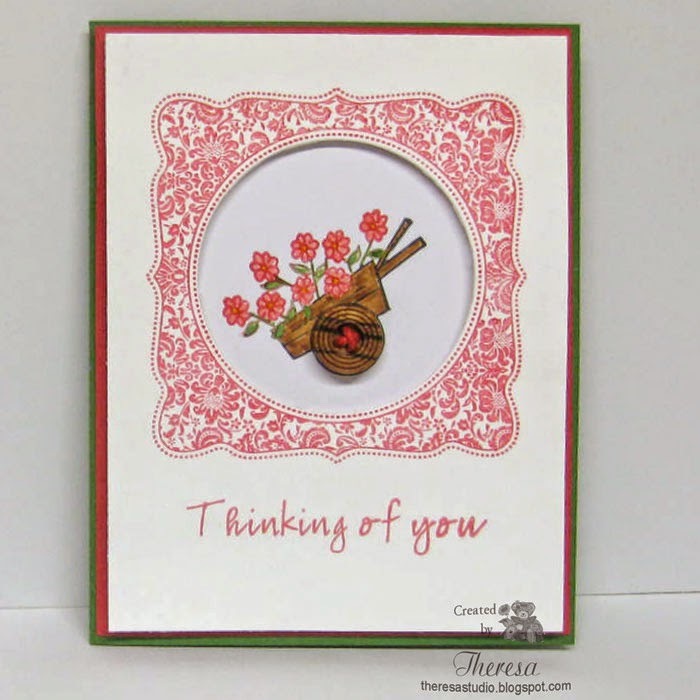 Today I have a card made with Gina K Stamps frame from Lovely Labels 2, a sentiment from Stippled Nature, and an image of a wheelbarrow that I won in a great grab bag from GKD. The image was stamped and recessed beneath the Label Frame which I cut out the center with a circle die. The frame was popped up above the image with pop up dots. I assembled the card on a green card base with a mat of red topped with the framed image. The card looks BIRL because the photo distorted the margins of red and green because of the way I had card sitting. I was too lazy to redo the photo. I added a wooden button with twine for the wheel of the cart. Thought this was the perfect size and type of button. 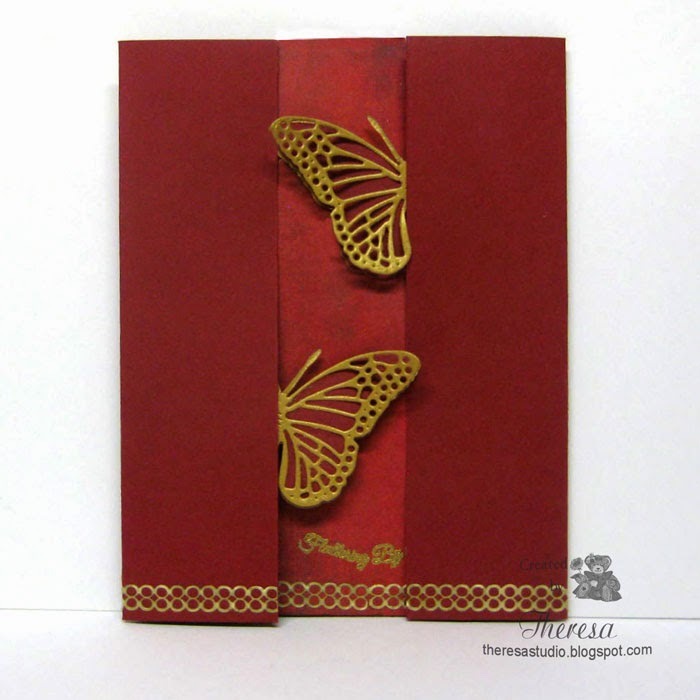 Stamp TV: Release challenge is RECESSED - make a card with a recessed focal image. 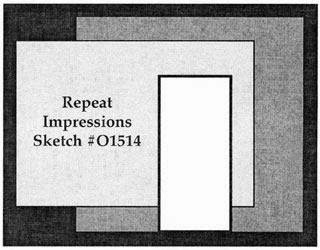 The focal image has to be down inside of it and the frame should be a layer above the image. Mod Squad Challenge Blog: Who's Got the button? Welcome! 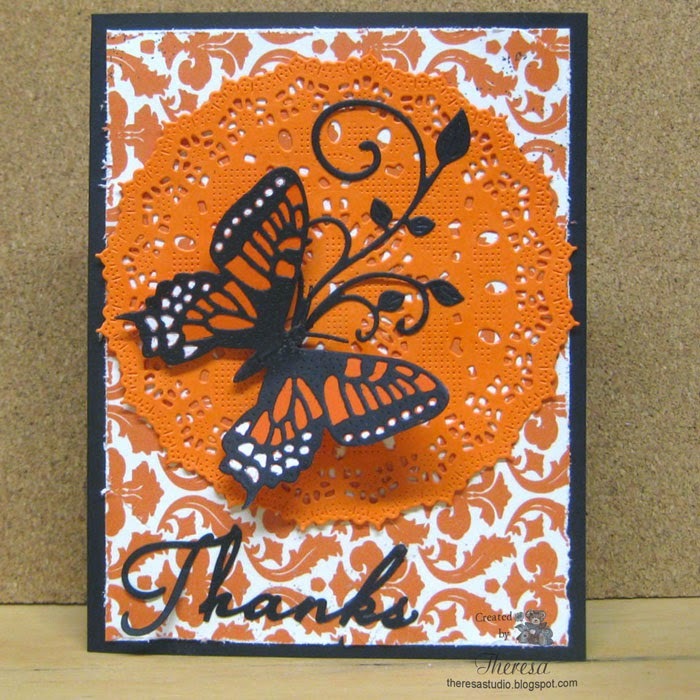 I had in mind to make a Halloween card using orange and black but I got sidelined making a Black and Orange Butterfly so I ended up with a Thank you Card since I came across an already cut die word. This was a card that just evolved on its own.....not what I had planned. Today I am sharing a card that I made for the Repeat Impressions Sketch #0514 Challenge at The House That Stamps Built shown on the right. I did give the sketch a turn to the right for my use. 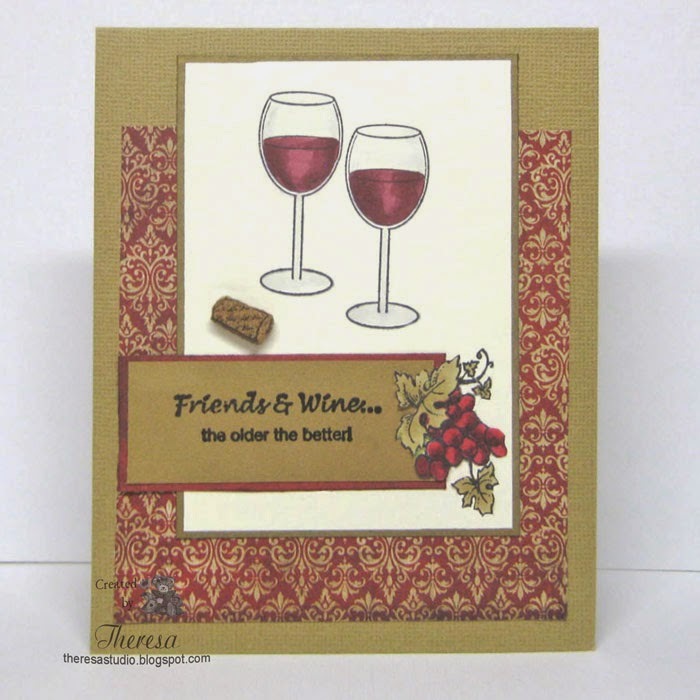 I love the Repeat Impressions Wine Series stamps which I have used for all the stamping. The Wine Glasses were inked with Memento Tuxedo Black on to a rectangle of Ivory CS and colored with Copics R46 and R59 and shaded with a bit of gray. I edged this with a Gold Metallic marker. 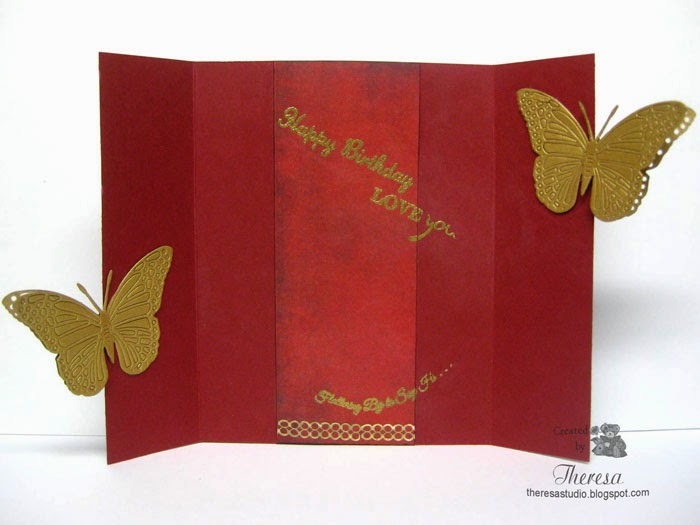 To assemble the card, a Gold textured card base card was layered with a panel of pattern paper from Teresa Collins World Traveler pad. 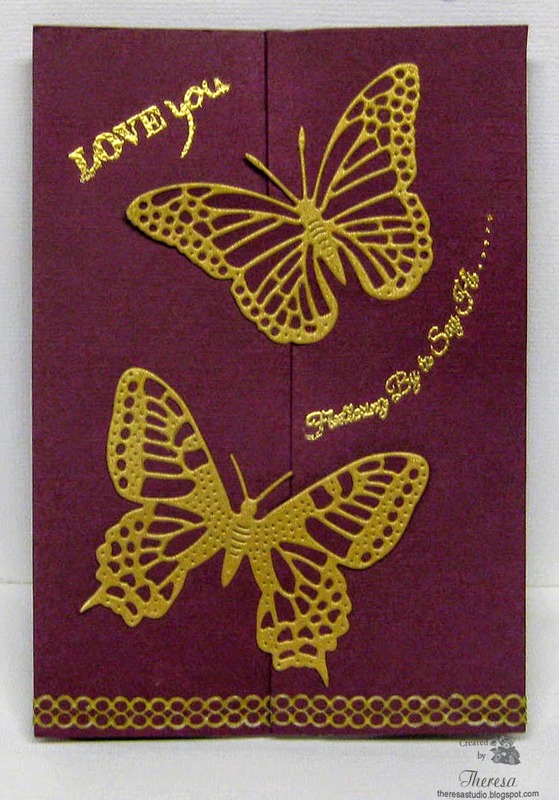 The sentiment was done with Versamark and Black EP on a Gold Metallic CS scrap and layered on a strip of Wine CS. For embellishments I stamped the grape cluster and colored with the same Red Copics and Y28 and stamped the cork on a scrap of actual cork paper. These were fussy cut and attached. I am pleased with the richness of this design. Today I am playing with LOTV's stamp of Bears with a Snowman stamped on white CS with Memento Tuxedo Black ink and colored with Copics N 0,2,4, C00, B0000, YG67,G05. I sponged the sky with Memento Summer Sky and added snow with Liquid Pearls and Frosted Lace Stickles. The image was cut with a circle die and matted on a Red Circle. 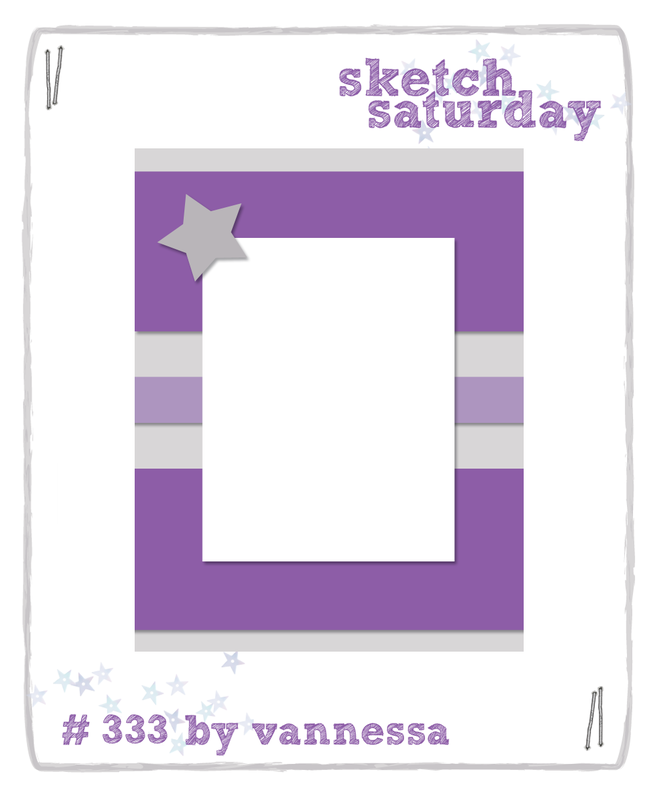 I decided to make this a gatefold card and used the sketch from Sketch Saturday. 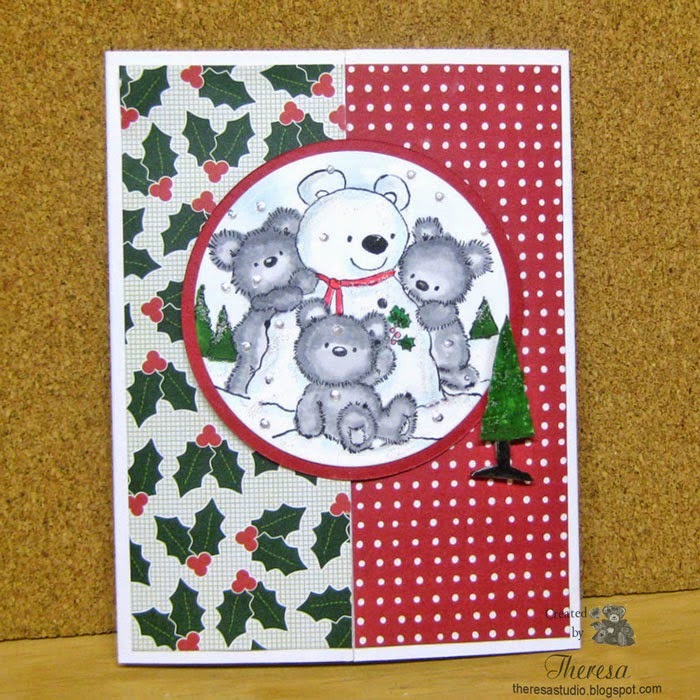 I used White CS for the card base and added panels of patterns from Pebbles Welcome Christmas paper pad. I stamped, colored and cut out a tree to hold the card shut. This was attached with pop up dots. I finished the inside with a sentiment from Heartfelt Collection stamped in Memento Lady Bug ink and more circles. Use something round on your Christmas Card. LOTV's Monthly Sketch : Anything goes with a Lili of the Valley stamp. Oldie But a Goodie: Theme is Christmas. LOTV Stamp is older than 6 months. Alphabet Challenge: R is for round or rectangle. Lot of round on my card. Thanks for stopping by. I enjoy all your comments and visits. 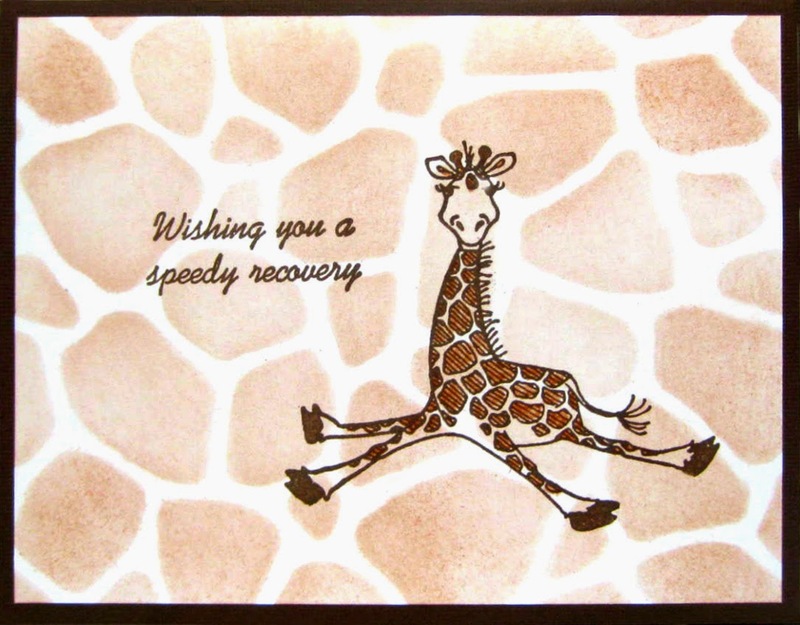 Giraffe sends Get Well Wishes. 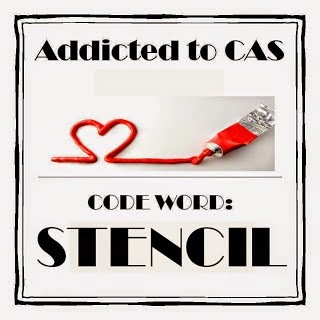 This is my entry for the challenge at Addicted to CAS for the code word Stencil. My card was made with a stencil that reminded me of the spots of a Giraffe. 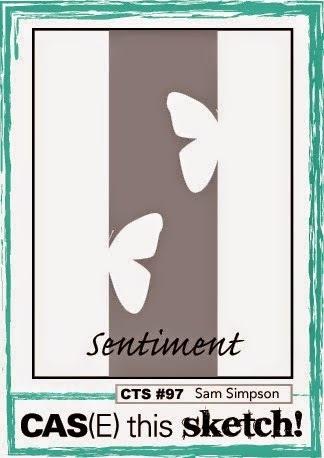 After brushing brown ink on white CS using the stencil, I stamped the Giraffe stamp and sentiment with a darker ink. Used Marvy inks. Sorry I do not have the source of the stamps. Giraffe was colored with pencils. Card base is brown CS. I made this card at my last Stamp club meeting. Love the comical look of the Giraffe. Hello! I have been away from blogging for a few days but am here today with an entry for some challenges. I made this winter theme card with Repeat Impressions stamp of Whitetail Deer that I stamped with Memento Rich Cocoa ink and colored with Copics. I sponged the background of the image with SU Sage Shadow ink and added some glittery snowflakes with Versamark and PSX Snowflake Embossing Tinsel. I added some strips of Fancy Pants pattern from Timbergrove pad to the Card base of aqua CS from stash. Base was embossed with Darice EF Snowflakes. Added some sparkle with Wink of Stella pen and Clearstar pen. Finished with a cut out sentiment from the pattern paper. 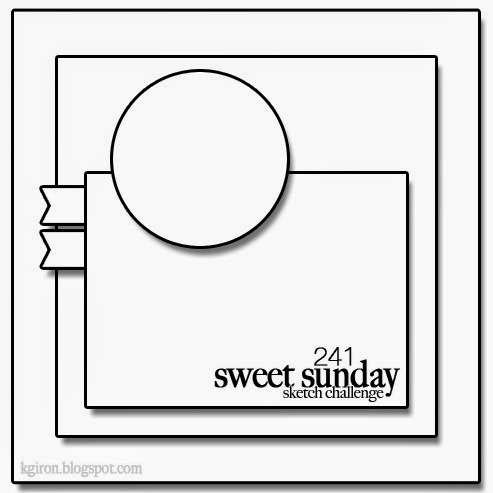 Addicted to Stamps and More: Challenge #117-Make your mark. 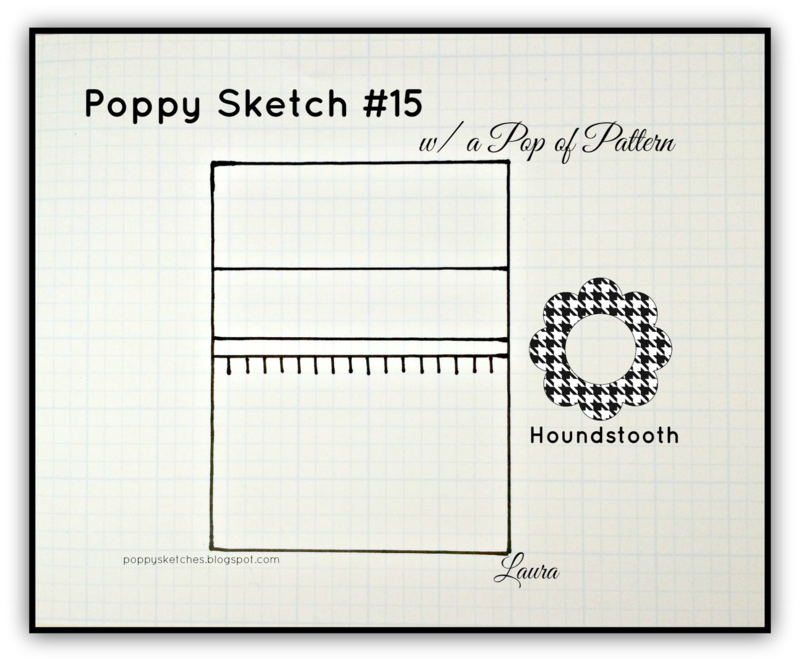 Tuesday Morning Sketches: Sketch shown to right. This week there is a twist to do holiday themes. My personal Holiday is to celebrate the first snow of winter.....always a festive day at our house. Hello! 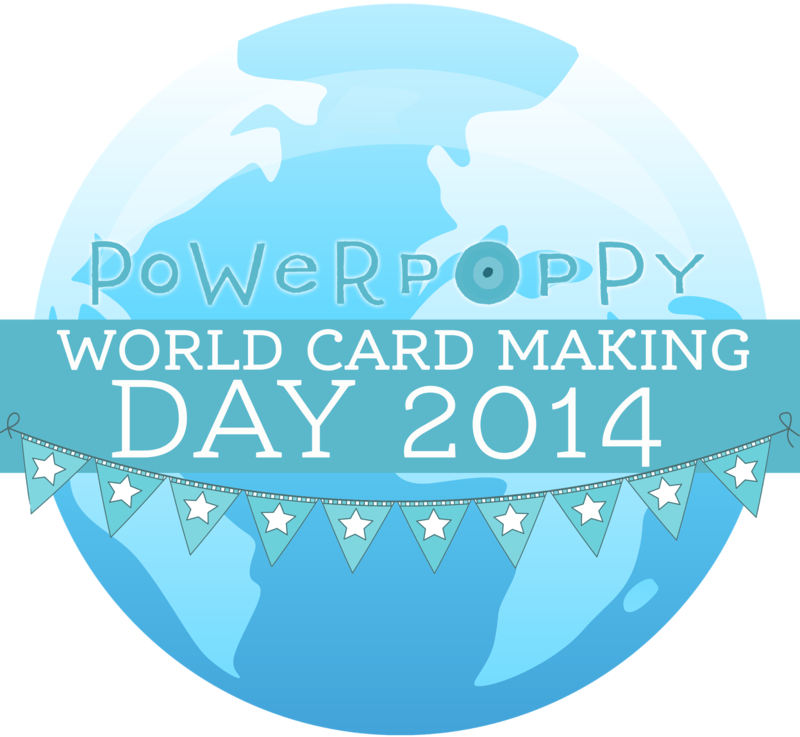 Today I am posting an entry for Power Poppy World Card Making Challenge #4 to get Up Close and Personal. We are to look around for some of our favorite things — make them personal — and be inspired! Take a photo of a few of those things and then, see it as a bit of an inspiration challenge — spark a little creativity with the textures, the colors, or even the objects. 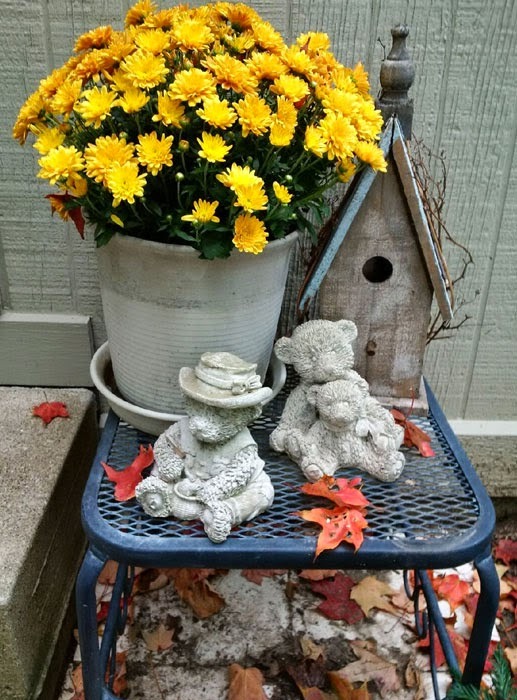 Some of my favorite thing are represented in this photo taken by my DH - Teddy Bears, Flowers, Gardening, Birds and Birdhouses, and Fall Leaves and Colors. We love and collect Teddy Bears including cuddly ones and concrete ones we have in our garden. The bears in the photo are Stony and Sharon (as in Sharon Stone) with Chipper. A few of the other garden bears are Rocksand and Brownstone. Yes, we name all our bears! I also love flowers of all kinds and the beautiful colors of fall. 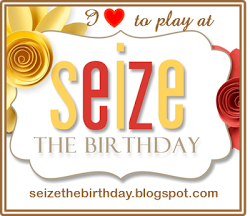 I used these items as inspiration for my card shown below. Stamps used are Power Poppy Sunny Harvest for the bouquet, Hen & Chicks for the sentiment. The Bear is an old PSX stamp, one of my faves. Used Memento Rich Cocoa and Espresso Truffle and Copics Y02,06,13,17,21,YR 14, YG 09,63, E00,43,44,47, and Memento Red Marker. The bouquet was fussy cut and attached with Pop up dots. Papers used were GKD White CS and a pattern paper from scraps. 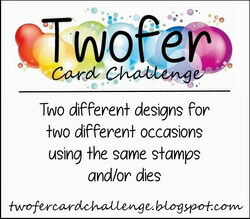 Power Poppy World Card Making Challenge #4: Use personal favorite things as inspiration to make a card. Hello! This month Split Coast Stampers is holding its annual Hope You Can Cling To Campaign to . Read all the details here. 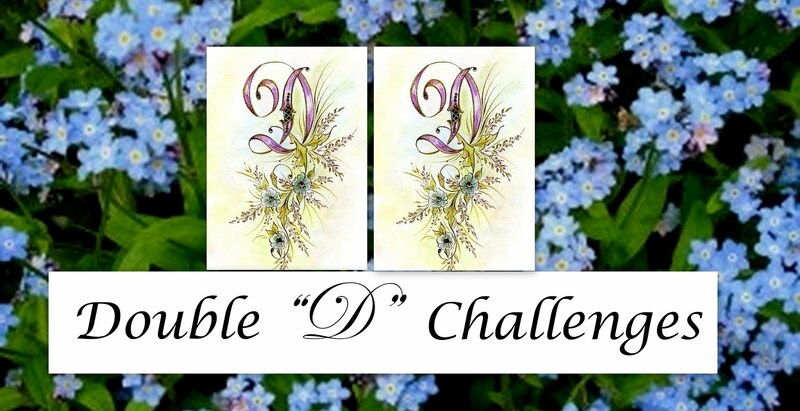 I made this card for Dina K's challenge to use something on your card that we hold on to daily -- a HANDLE. Keyword HYCCT1401C . Read more here. 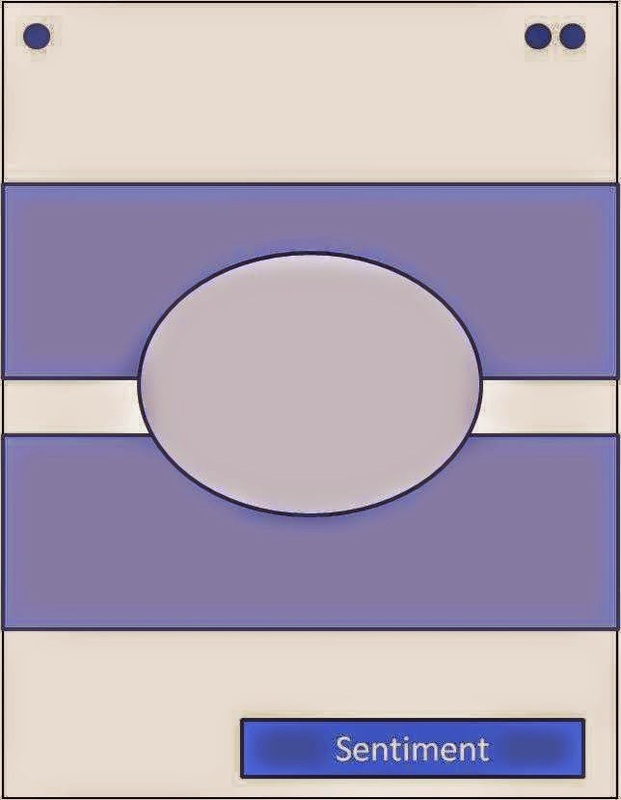 I made this shaped card using a template that I have had a long time but do not remember the source. 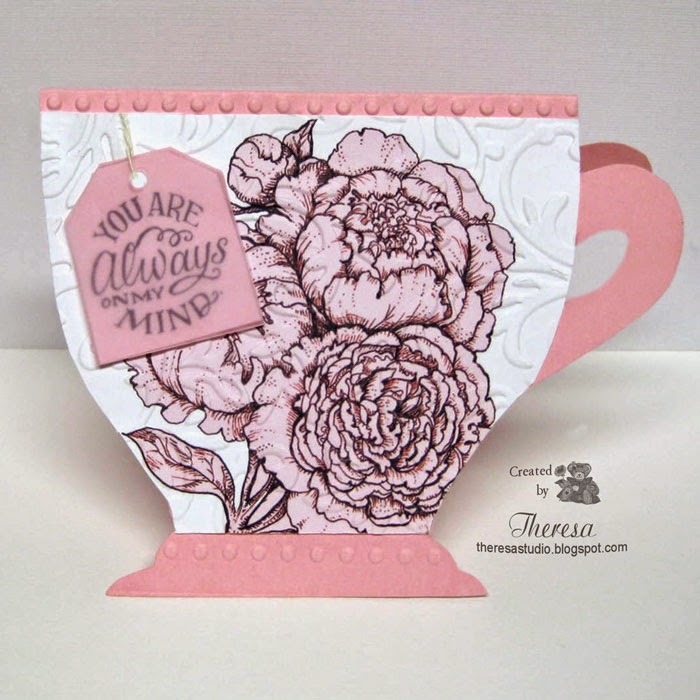 I cut the teacup from pink CS and then added a design to the cup using Power Poppy Peonies Digi that I colored on the computer, sized and printed on white CS. I embossed this layer with Cuttlebug EF Victoria and attached to the cup after trimming with the template. I also added rows of embossed dots with Cuttlebug EF Border. I stamped the sentiment from Power Poppy Azaleas on white CS with Memento Tuxedo Black and inserted into a Pink Vellum teabag hung on a string. Power Poppy World Day Card Making: Challenge 3 Choose Hope, Think Pink. Join in one of the Challenges at SCS for HYCCT. 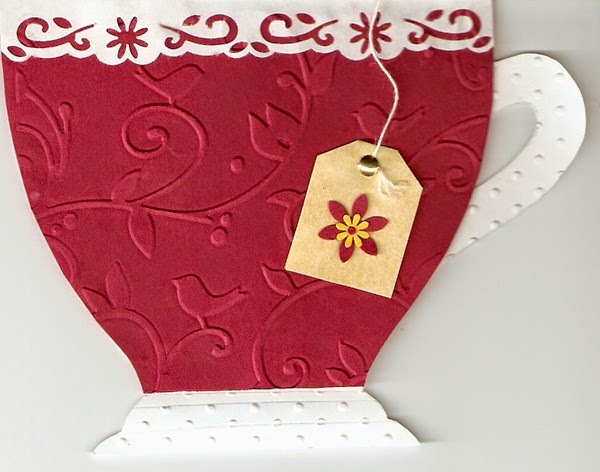 I thought I'd share this first Teacup card made in 2009.